Whyalla Maritime Museum is a brilliant museum, a visit is like re-living Whyalla’s past. Whyalla and it’s shipyards had a role in World War II and the museum highlights this in fascinating style. 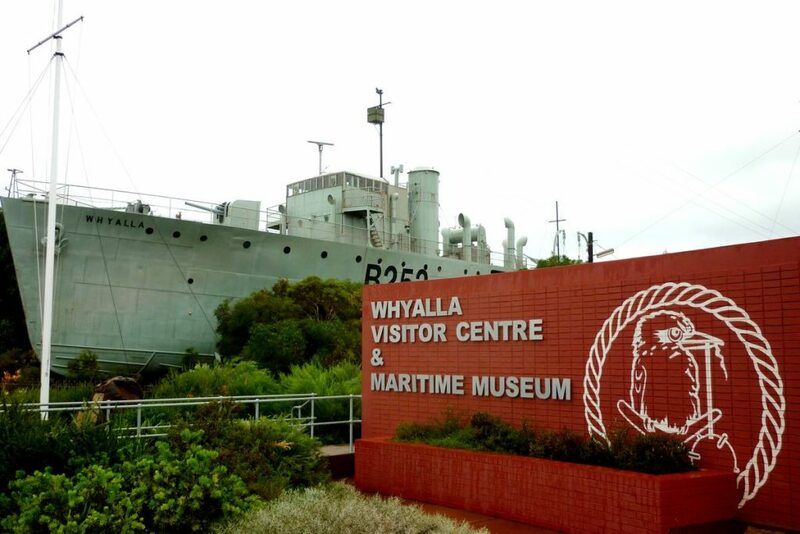 You can even board and explore the the HMAS Whyalla, which was the first ship built on site. The HMAS Whyalla served in World War II as a minesweeper. The enthusiastic and entertaining staff are part of what makes a guided tour of the HMAS Whyalla so good. Great stories and an insight into what life was like on a warship during World War II are eye opening for sure. The little ones will love sitting on the guns and taking turns turning the big wheel with a captain’s hat on. There’s a fascinating short movie to watch as well, detailing how the HMAS Whyalla was dry-docked at it’s current location. Kids and adults alike will be fascinated by the impressive model railway, Whyalla in miniature, as well as the collection of artefacts from Whyalla’s past and the stories which accompany them. Entry is just $12 per person, that gets you a 40 minute guided tour of the HMAS Whyalla and unlimited access to the museum. Tours are at 11.30am and 1.30pm.